Pouted as the most visited social media “network” in the world, Facebook’s main aim of bringing the world​ closer together is at its peak. The platform itself has in so many ways helped a lot of people to meet and communicate with “one other” while staying safe. Aside from this, Facebook tends to be the best place to promote legit products across to over 2 billion peoples and the results thereafter are in one word quite astonishing. But despite offering a slew of features, Facebook mobile site still have some hiccups and we are going to address them in this article. Also Read: Hidden Facebook Messenger Tricks You Should Know. Indubitably, most of the “websites” on the internet have evolved from what we know them to be in the last 6 years, and Facebook isn’t in any way “different”. The company launched a “lightweight version” of itself which was specifically targeted at mobile users and aside from it being responsive, it’s also “incredibly” fast. While Facebook mobile site may seem “smooth” especially for “non-power” users, it “isn’t” in anyway impeccable as it often hides some certain features and functionality that makes the site thick, therefore limiting what mobile users can “see or do”. So today, we’ll show you how to access Facebook full site on mobile phones. Yeah I know, the above subheading sounds “cumbersome’ since a lot of folks wouldn’t want to go through the hassles of typing a URL manually just to access Facebook full site. But you do know “when the desirable isn’t available, the available becomes desirable. So no matter how stressful it may seem, one of the best way to access Facebook desktop site is by using a unique URL which we are going to unveil below. 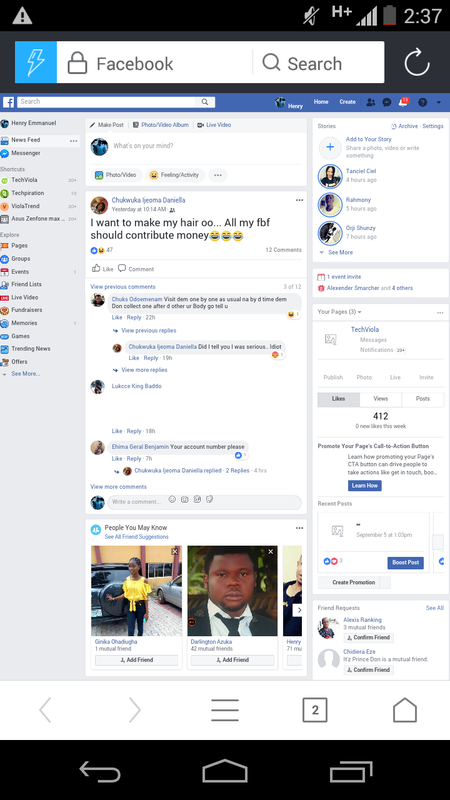 Secondly, you can easily access Facebook full site or “desktop view” with the help of any third-party “and/or” in-built browsers available on your mobile phone. On most devices such as Android and iOS, Google Chrome and Safari browser comes built-in. So if you need the Puffin browser, you can easily head over to the Google Play to download it. Now without further delay, here’s how to access Facebook full site on Android and iOS. Open up the Chrome browser that’s installed on your mobile phone. From here, tap the 3 dotted icon on the upper right corner, then scroll down and enable “Request Desktop Site”. Once that’s done, simply go to facebook.com and the page should now be in desktop view. Puffin web browser by default let’s you experience the desktop mode of any site. It’s crazily fast and offers a ton of useful features. Simply enter the Facebook URL (facebook.com) into puffin’s search section and you are good to go. In case the page doesn’t load in desktop view, click on the triple dots on the upper right corner of the app, then select Request Desktop Site. On iOS, Facebook full site can be accessed using Safari browser. So here’s how to get this one going. Go to facebook.com, from here, tap and hold the refresh icon located in the URL bar, now you’ll see the Request Desktop Site option at the bottom of the browser. Simply tap on it and you’re good to go. Alternatively, you can use the share sheet method which works perfectly too. Here’s how to go about it. Fire up Facebook, then simply scroll up a little and the share icon will appear (it’s a square with an arrow). Click on it and select Request Desktop Site on the next screen. Accessing Facebook on mobile like you’ve a regular computer isn’t a bad experience I guess. All the functionalities & features are all there for you to explore. So with the above method, you can easily access Facebook full site on Android and iOS.